Nepal Travel 7 days, Splendor Nepal is an exciting leisure vacation tour in Nepal. This tour incorporates Nepal’s three attractive tourist destinations. They are Kathmandu, Bandipur, and Pokhara. Thus this holiday is also recognized as Kathmandu Bandipur Pokhara tour. Indeed, Nepal Travel 7 days is the journey of the discovery of fascinating art and architecture in Kathmandu. Further, it grants to experience rural lifestyle with the quiet environment in Bandipur. Besides it also take you to observe God gifted natural awesome sights in Pokhara. Nepal Tour 6 nights 7 days begins by travel around Thamel. As it is the tourist centered place of Kathmandu city here you find lots of restaurants, bars, cafes, souvenir shops. Next day, our professional guide escorts you to visit World Heritage Sites of Kathmandu city. They are Boudhanath, Pashupatinath, Swoyambhunath & Kathmandu Durbar Square. Boudhanath is the largest Buddha temple in Nepal. Because of its environment, many tourists say this almost looks Little Tibet. Likewise, Pashupatinath is one of the highly sacred Shiva Temples in the earth and it lies on the bank of the holy Bagmati River. Then, Swoyambhunath is a beautiful Buddha stupa is standing on the top of the western hill of Kathmandu city. Lastly, Kathmandu Durbar Square is the complex of the royal palace. It has many temples and monuments in a different structure. On the third day, you drive to Bandipur. It is really beautiful hill town famous as Queen of Hills and seems like living museum of Newari culture. After one night halt in Bandipur, you move to Pokhara. By nature, Pokhara is a scenic valley with Himalayan views. Upon reaching Pokhara first of all you visit David Fall then Shiva Cave followed by World Peace Stupa. This white colored Buddhist shrine is located on the southern hilltop of Pokhara from where you enjoy the stunning sunset. Next morning you wake up early to drive Sarangkot hill for enchanting Sunrise. Besides Sunrise this sport also offers you the great views of Mount Fishtail, Mount Annapurna, and its range. In the afternoon you also visit Bindavashi Temple, Seti River Gorge, and Barahi temple. From Pokhara, you drive back to Kathmandu where you end this mesmerizing trip with farewell dinner at typical Nepali restaurant with folk dances of Nepal. Nepal Travel 7 days is a wonderful holiday trip of Nepal. You can make it further exciting by joining in extra activities/ side trips. As the interest of people is different from each other, we have put these extra activities as optional tours. They are not included in your package cost. On your request, we offer you. The list of optional activities is displayed in right column. Day 3: Drive to Bandipur. 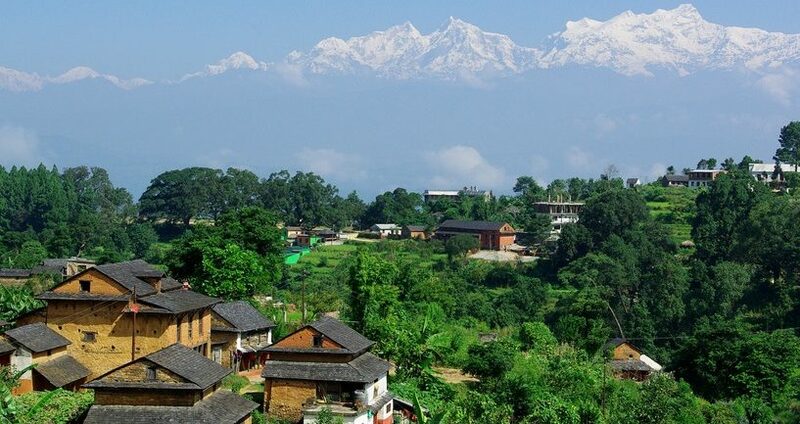 Highlight: Explore of Bandipur, famous as Queen of Hills and a living museum of Newari culture. Day 4: Drive to Pokhara. Sightseeing of Pokhara. Highlight: Visit of David Water Fall, Shiva Cave/ Word Peace Pagoda Sun Set tour/ 1 hr boating with Barahi Temple/ Walk around Lake Side Street. Day 5: Sightseeing of Pokhara. Highlight: Sun rise tour of Sarangkot with Himalayan vista/ Visit of Bindavashini temple & Seti river gorge/ Free time & walk around Lake Side Street market. Day 6: Drive back Kathmandu. Highlight: Scenic Pokhara – Kathmandu drive. Free time of shopping/ Culture Show and dinner with Nepali Cuisine. Day 7: Departure from Katmandu, Nepal.